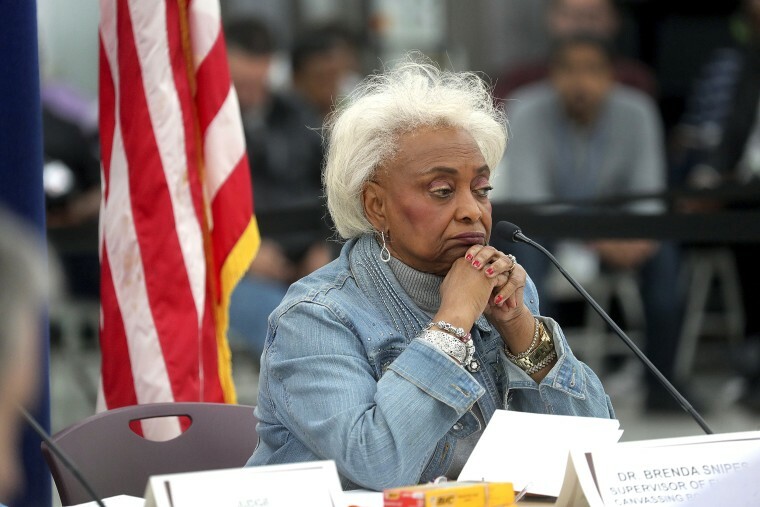 Embattled Broward County, Florida, elections supervisor Brenda Snipes said Saturday she was rescinding her resignation. The move announced by her attorney came a day after Republican Gov. Rick Scott, citing "misfeasance, incompetence and neglect of duty," issued an executive order to immediately remove and replace her. Snipes' attorney, Burnadette Norris-Weeks, said Saturday that Scott removed her because he wanted to embarrass her and "tarnish her record." " ... and we will be fighting this," Norris-Weeks said. "In addition to that, Dr. Snipes hereby rescinds her resignation." Republican leaders, including President Trump, criticized Snipes for her handling of the Nov. 6 election in which Scott defeated Democratic Sen. Bill Nelson for U.S. Senate. Some in the GOP made unsubstantiated allegations of voter fraud. Snipes also was blamed for failing to produce data quickly on the vote count and for 22 voided ballots that were accidentally mixed in with valid ones. Snipes submitted her resignation Nov. 18, saying she was deeply troubled by the GOP allegations during a tumultuous election that also saw Democratic gubernatorial contender Andrew Gillum concede to Republican Ron DeSantis. Her resignation was supposed take effect in January. But Scott announced Friday that Snipes had to go immediately, and he replaced her with Peter Antonacci, head of Enterprise Florida, a public-private joint venture that promotes business development in the state. "After a series of inexcusable actions, it's clear that there needs to be an immediate change in Broward County and taxpayers should no longer be burdened by paying a salary for a Supervisor of Elections who has already announced her resignation," Scott said Friday.